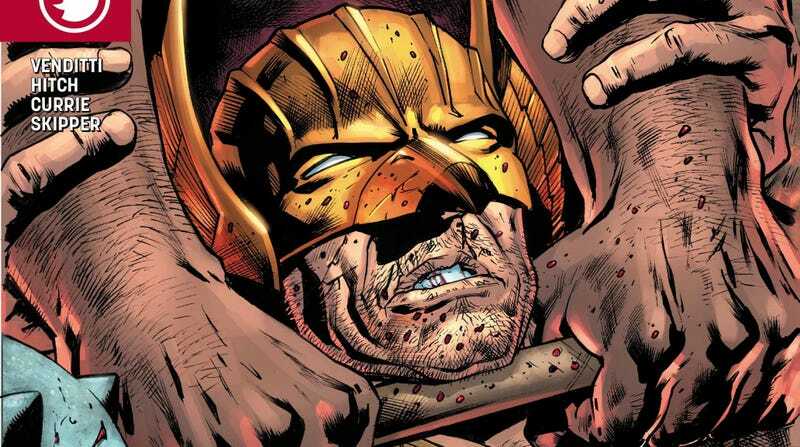 Creators have changed Hawkman’s history many times over the years, but the current Hawkman series gives the character a clearer mission statement by tying his resurrections to a spiritual debt that must be paid. Millennia ago, an alien man name Ktar helped the Deathbringers rain destruction upon the universe, and he resurrects until he’s saved enough lives to make up for all those he killed. Written by Robert Venditti with artwork by Bryan Hitch, inker Andrew Currie, colorist Jeremiah Skipper, and letterers Starkings and Comicraft, Hawkman has grown from a rousing Indiana Jones-esque adventure to an epic superhero showdown between Carter Hall and the cosmic death force he used to lead. This creative team has made Hawkman an exciting journey through the DC Universe that uses the hero’s resurrections to lead him to new locales and points in history, learning about his past along the way. Now, the lesson is over, and it’s time to fight. The Deathbringers have finally come for Earth, and this exclusive preview of this week’s Hawkman #9 has Carter reaching out to an old friend as a last-minute gambit. This excerpt ends right before the spectacle begins, but the rest of this issue is full of the wide-scale action and dramatic superhero imagery that is Hitch’s forte. These pages showcase the specificity that the art team brings to different environments, and given how dramatically the setting changes in this book, this skill has been used a lot. Hitch has successfully delivered nine monthly issues without any delays, which is quite a feat considering the scope of what Venditti asks him to draw. Hitch’s art is still jam-packed with details, but his line work is looser, which helps make his characters more animated. It also helps that he’s working with a frequent collaborator in Currie, who understands how to sharpen Hitch’s pencils so that conversations and action scenes are lively. Skipper’s coloring similarly offers realistic detail without over-rendering, and the crisp, clean shading and textures enhance the line work without pulling focus from it. This Hawkman run has flown under the radar, but readers looking for exhilarating action and an unconventional character study will be pleased with how it revitalizes its central hero.